Definition at line 140 of file llviewerinventory.h. Definition at line 143 of file llviewerinventory.h. Definition at line 168 of file llviewerinventory.h. Definition at line 178 of file llviewerinventory.h. Definition at line 350 of file llviewerinventory.cpp. Definition at line 324 of file llviewerinventory.cpp. Definition at line 337 of file llviewerinventory.cpp. Definition at line 345 of file llviewerinventory.cpp. Definition at line 355 of file llviewerinventory.cpp. References LLInventoryCategory::copy(), mDescendentCount, mDescendentsRequested, mOwnerID, and mVersion. Referenced by LLViewerInventoryCategory(), and LLInventoryModel::updateCategory(). Definition at line 527 of file llviewerinventory.cpp. References LLAssetType::lookup(), LLInventoryObject::mName, mOwnerID, LLInventoryObject::mParentUUID, LLInventoryCategory::mPreferredType, LLInventoryObject::mType, LLInventoryObject::mUUID, mVersion, LLUUID::toString(), and UUID_STR_LENGTH. Definition at line 426 of file llviewerinventory.cpp. References LLMessageSystem::addBOOL(), LLMessageSystem::addS32(), LLMessageSystem::addUUID(), f, FALSE, gAgent, LLAgent::getID(), LLAgent::getSessionID(), LLControlGroup::getU32(), gMessageSystem, gSavedSettings, LLFrameTimer::hasExpired(), mDescendentsRequested, mOwnerID, LLInventoryObject::mUUID, mVersion, LLMessageSystem::newMessage(), LLMessageSystem::nextBlock(), LLFrameTimer::reset(), LLAgent::sendReliableMessage(), LLFrameTimer::setTimerExpirySec(), TRUE, and VERSION_UNKNOWN. Referenced by LLInventoryModel::backgroundFetch(), LLInventoryFetchComboObserver::fetch(), LLInventoryFetchDescendentsObserver::fetchDescendents(), and LLInventoryModel::fetchDescendentsOf(). Definition at line 179 of file llviewerinventory.h. Referenced by LLInventoryModel::accountForUpdate(), LLInventoryModel::categoryHasChildren(), LLInventoryModel::isCategoryComplete(), and LLInventoryFetchDescendentsObserver::isComplete(). Definition at line 165 of file llviewerinventory.h. Definition at line 169 of file llviewerinventory.h. Referenced by LLInventoryModel::accountForUpdate(), LLInventoryModel::backgroundFetch(), LLInventoryModel::categoryHasChildren(), LLInventoryModel::isCategoryComplete(), LLInventoryFetchDescendentsObserver::isComplete(), LLFolderBridge::isUpToDate(), LLInventoryModel::loadSkeleton(), and LLInventoryModel::saveToFile(). Definition at line 458 of file llviewerinventory.cpp. References llendl, llwarns, LLAssetType::lookup(), MAX_STRING, LLInventoryObject::mName, mOwnerID, LLInventoryObject::mParentUUID, LLInventoryCategory::mPreferredType, LLInventoryObject::mType, LLInventoryObject::mUUID, mVersion, NULL, LLStringBase< char >::replaceChar(), LLStringBase< char >::replaceNonstandardASCII(), and LLUUID::set(). Definition at line 402 of file llviewerinventory.cpp. References _PREHASH_AgentData, _PREHASH_AgentID, _PREHASH_FolderData, _PREHASH_FolderID, _PREHASH_RemoveInventoryFolder, _PREHASH_SessionID, LLInventoryModel::accountForUpdate(), LLMessageSystem::addUUIDFast(), LLAssetType::AT_NONE, gAgent, LLAgent::getID(), LLAgent::getSessionID(), gInventory, gMessageSystem, llendl, llinfos, LLInventoryObject::mParentUUID, LLInventoryCategory::mPreferredType, LLInventoryObject::mUUID, LLMessageSystem::newMessageFast(), LLMessageSystem::nextBlockFast(), LLAgent::sendReliableMessage(), and LLNotifyBox::showXml(). Definition at line 180 of file llviewerinventory.h. 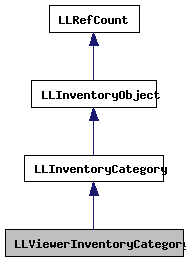 Referenced by LLInventoryModel::accountForUpdate(), LLInventoryModel::loadSkeleton(), and LLInventoryModel::processInventoryDescendents(). Definition at line 170 of file llviewerinventory.h. Definition at line 365 of file llviewerinventory.cpp. References _PREHASH_AgentData, _PREHASH_AgentID, _PREHASH_FolderID, _PREHASH_InventoryData, _PREHASH_MoveInventoryFolder, _PREHASH_ParentID, _PREHASH_SessionID, LLMessageSystem::addBOOL(), LLMessageSystem::addUUIDFast(), gAgent, LLAgent::getID(), LLAgent::getSessionID(), gMessageSystem, LLInventoryObject::mParentUUID, LLInventoryObject::mUUID, LLMessageSystem::newMessageFast(), LLMessageSystem::nextBlockFast(), and LLAgent::sendReliableMessage(). Definition at line 380 of file llviewerinventory.cpp. References _PREHASH_AgentData, _PREHASH_AgentID, _PREHASH_FolderData, _PREHASH_SessionID, _PREHASH_UpdateInventoryFolder, LLInventoryModel::accountForUpdate(), LLMessageSystem::addUUIDFast(), LLAssetType::AT_NONE, gAgent, LLAgent::getID(), LLAgent::getSessionID(), gInventory, gMessageSystem, LLInventoryObject::mParentUUID, LLInventoryCategory::mPreferredType, LLMessageSystem::newMessageFast(), LLMessageSystem::nextBlockFast(), LLInventoryCategory::packMessage(), LLAgent::sendReliableMessage(), and LLNotifyBox::showXml(). Definition at line 190 of file llviewerinventory.h. Referenced by copy(), getDescendentCount(), and setDescendentCount(). Definition at line 191 of file llviewerinventory.h. 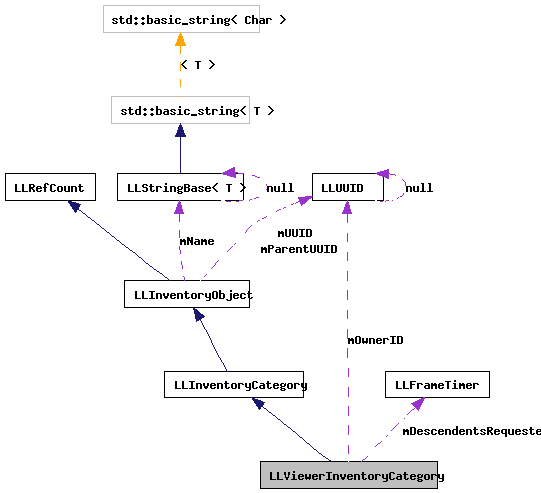 Referenced by copy(), fetchDescendents(), and LLViewerInventoryCategory(). Definition at line 188 of file llviewerinventory.h. Referenced by copy(), exportFileLocal(), fetchDescendents(), getOwnerID(), and importFileLocal(). Definition at line 189 of file llviewerinventory.h. Referenced by copy(), exportFileLocal(), fetchDescendents(), getVersion(), importFileLocal(), and setVersion().